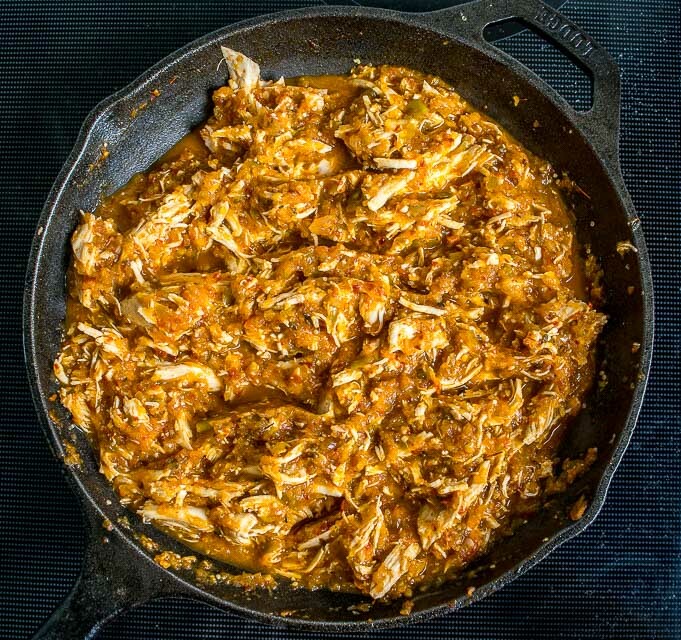 This fiery version of Chicken Tinga is looking for a permanent home, preferably somewhere in your fridge. In exchange, it’ll provide all sorts of impromptu meals loaded with that savory Tinga flavor — your job is to eat them. I’ve been keeping batches of this upgraded Tinga on standby for the last few weeks. It’s designed to be not only hotter, but a bit more saucy as well — kind of a standalone version that you can throw on a tortilla for an instant meal. Yes, those are tomatillos and their tartness makes Tinga come alive! I’ve tried Tinga recipes that use all tomatoes as the base but I find most of them disappointing. 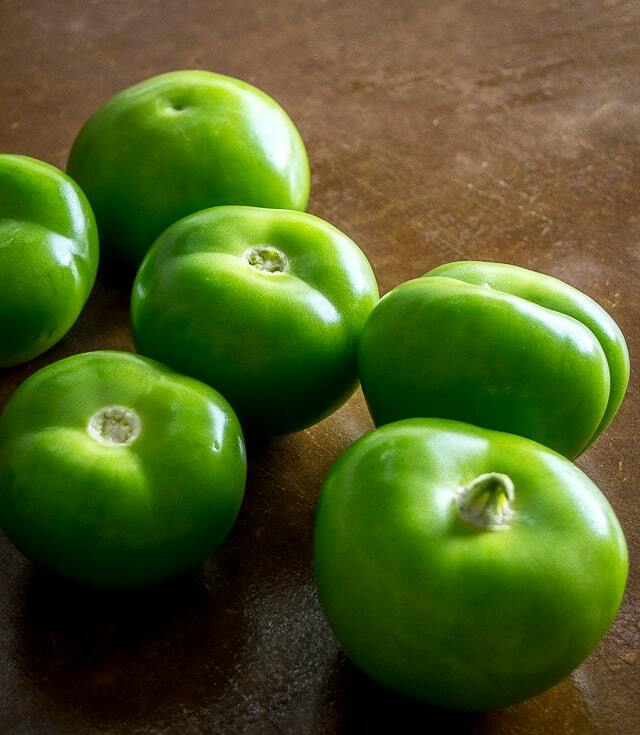 So keep an eye out for fresh tomatillos next time you’re at the market. Pull back the husks and buy the ones that have taut, green skin — if they’re wrinkled they are past their prime. I should also mention that this Tinga version has some real heat. You can always cut the chipotle amount in half for a milder batch. 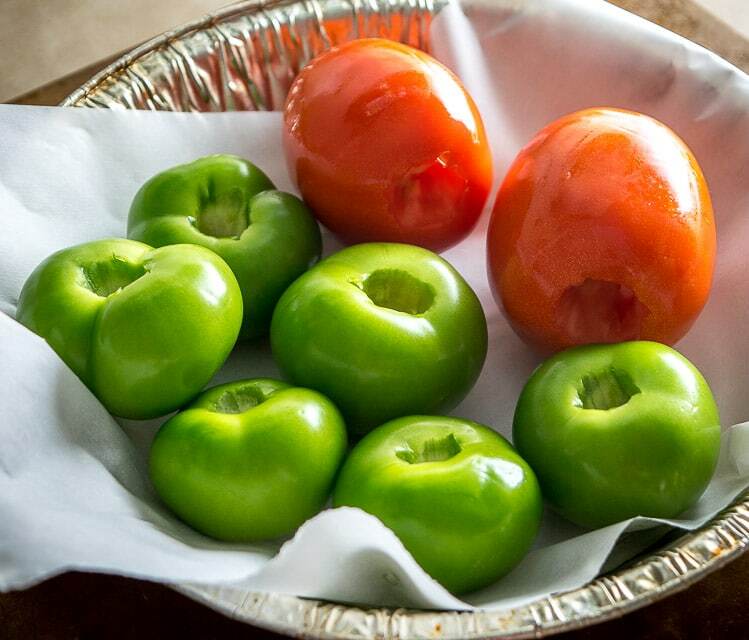 First things first, get those tomatoes and tomatillos roasting: 2 plum tomatoes and 5-6 tomatillos will do the job. Yes, you can char them in a skillet, but I’m still in the habit of tossing them in a 400F oven. Keep an eye on them as the tomatillos typically don’t need as long as the tomatoes to roast. Next up is the chicken, You could easily use shredded Rotisserie chicken, but I typically poach chicken breasts and then shred it using two forks. Simply cover two chicken breasts with cold tap water, bring to a boil, and then simmer for 20-25 minutes or until the chicken is cooked through. You can also add a bit of flavoring to the poaching water if you want — for this batch I added salt, pepper, onion, and cilantro. Meanwhile, saute 1/2 onion and 4 whole garlic cloves in some oil over medium heat. Cook until the onion is just starting to turn brown, approximately 5-8 minutes, and then add to a blender along with the roasted tomatoes and tomatillos. We’ll also add 5 chipotles in adobo. Yes, five! 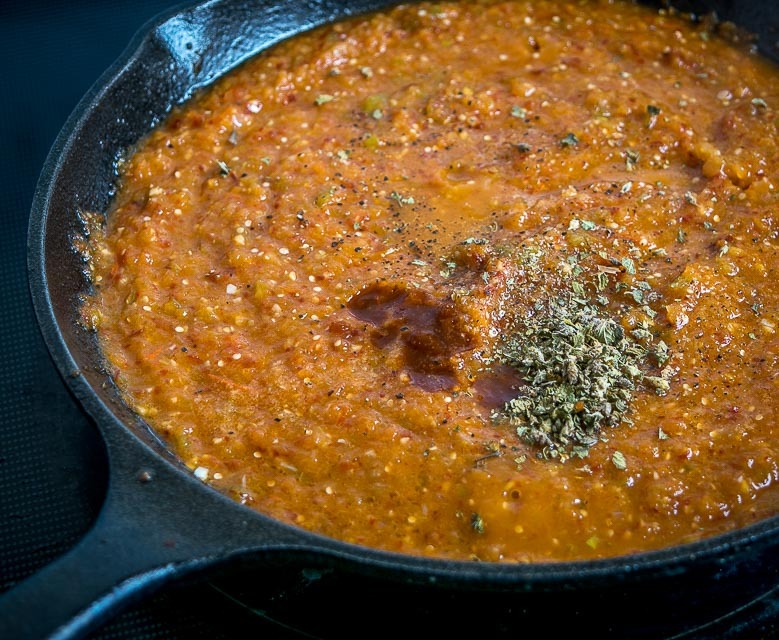 Give it a whirl but I tend to keep this sauce a bit chunky, pulse blending to combine it. If you give it a taste at this point it’s going to have some real heat, so consider yourself warned! I usually can’t resist and I’m always amazed at how much flavor it already has despite using just five ingredients so far. Heat a dollop of oil in a saucepan over medium heat. Add the sauce from the blender. Let this simmer for a few minutes and then add the shredded chicken. Combine well and then congratulate yourself for whipping up a batch of authentic Tinga. Easy right? Let this simmer until everything is at a uniform temperature. Definitely take another taste for salt level — I added another generous pinch to this batch. And if you are one of the lucky ones who sees five chipotles in a recipe and thinks “Only five?” then you can always add some more adobo sauce at this point to amp it up even more. 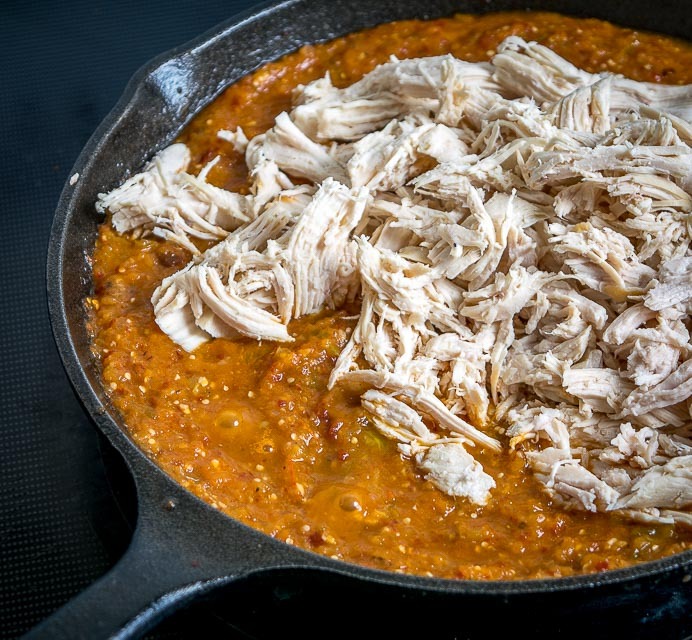 If all went according to plan you’ve got some lip-smacking Chicken Tinga on your hands — good enough to eat straight from the pan. As mentioned, I’ve been keeping some of this in the fridge for a week’s worth of no-thinking-involved meals. 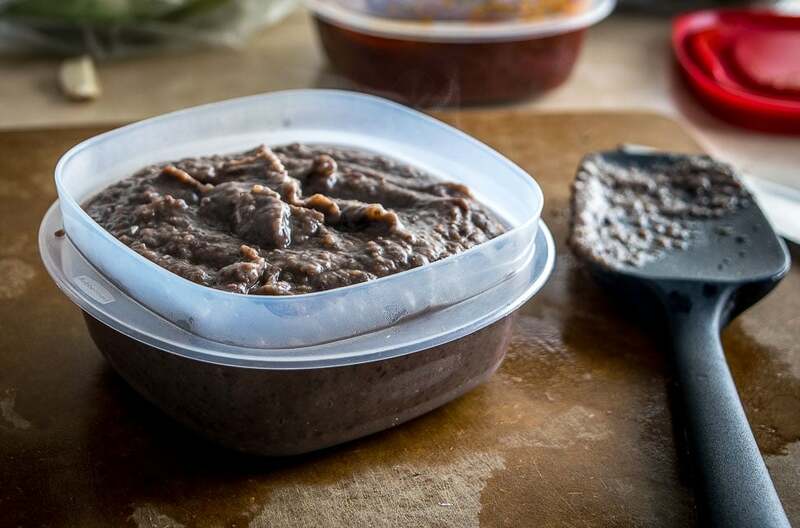 I also usually keep some of this black bean puree in the fridge. I think you can probably guess where this is going right? It works great on tostada shells, but really crispy tortillas will work too, so that’s what we’re making here. 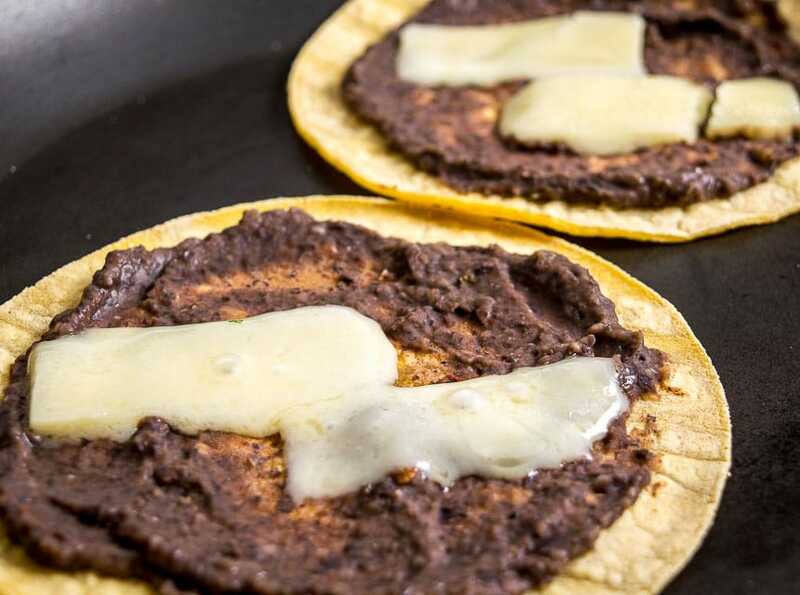 Simply add a thin layer of beans and cheese to a corn tortilla in a skillet or comal. Cook over medium heat until the cheese is melted and there are brown spots forming on the bottom of the tortillas. Add some piping hot Tinga and dinner is served! These are warm, goopy tacos that don’t need much else, but of course a final burst of acidity will make them pop even more. A squeeze of lime does the job quite well, but Pickled Onions are a good candidate too. The other combo to keep in mind is the one we used in our tacos post. You can serve Tinga with avocado bits, finely diced raw onion, and some Cotija cheese. This is a more traditional way of serving Tinga (and with less heat!). I also want to give some quick details on that black bean puree. It’s got incredible flavor and makes regular appearances on this site, so it could be worth adding it your arsenal. Once this simmers for a few minutes add it to a blender or food processor and combine well. Keep it on hand and you’ll always have the option of whipping up Black Bean Nachos, Molletes, or Black Bean and Guacamole Tostadas. Okay enough chatting, time to start cooking! Give a shout if you’ve got Chicken Tinga questions on your mind. It’s a great dish to have in your repertoire and it’ll lead to all sorts of satisfying meals. 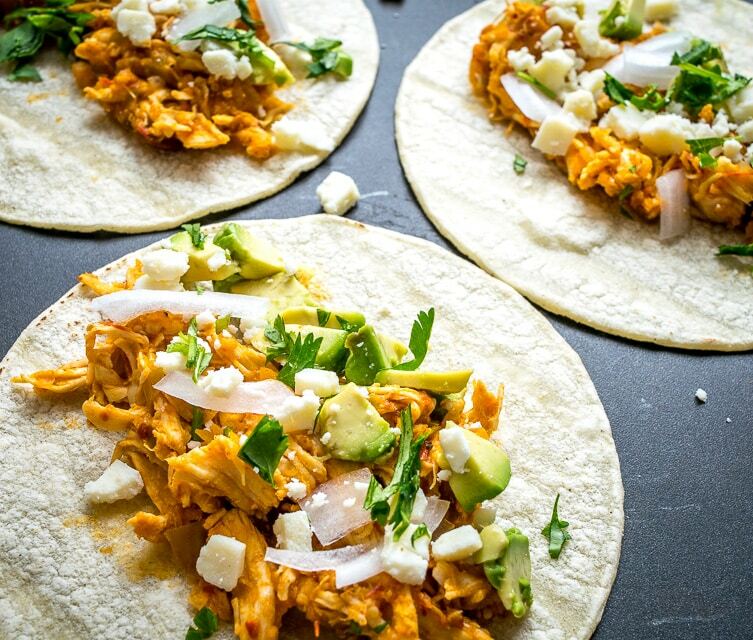 This is a delicious, fiery version of Chicken Tinga. The key is to use both tomatoes and tomatillos, along with plenty of chipotles! Give the tomatoes and tomatillos a good rinse. Roast them in a 400F oven for 20-25 minutes. Keep an eye on the tomatillos -- if they start to wither you can pull them out and let the tomatoes keep roasting. 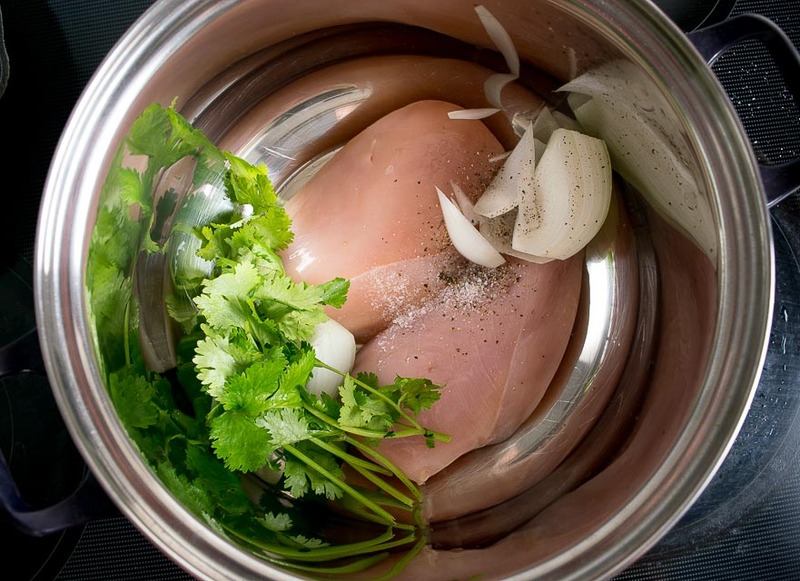 If you're cooking the chicken, add 2 chicken breasts to a saucepan and cover with cold tap water. Bring to a boil and then reduce heat to let simmer for 20-25 minutes or until the chicken is cooked through. You can optionally add some flavoring to the water -- for this batch I added salt, pepper, onion and cilantro. Once cooked, set the chicken breasts aside to cool and then use two forks to shred them. 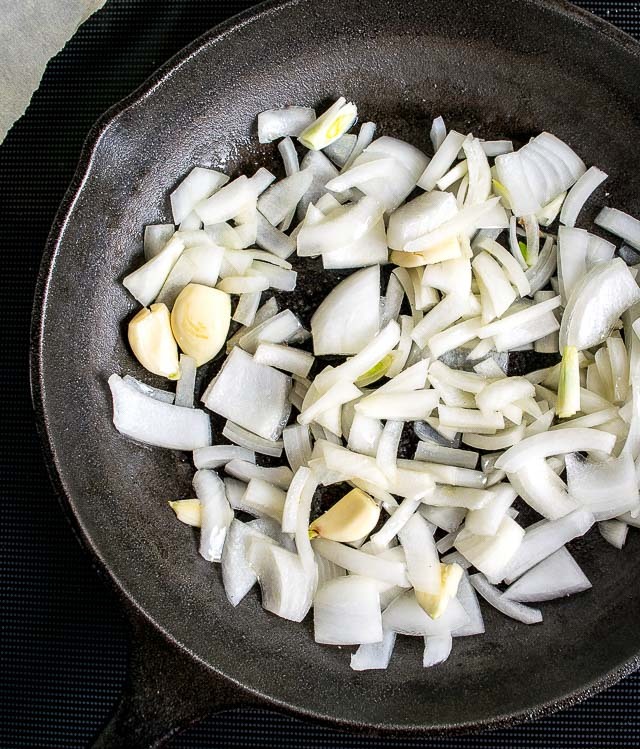 If you're making the beans, start by cooking 1/2 onion and 2 garlic cloves in a dollop of oil over medium heat. 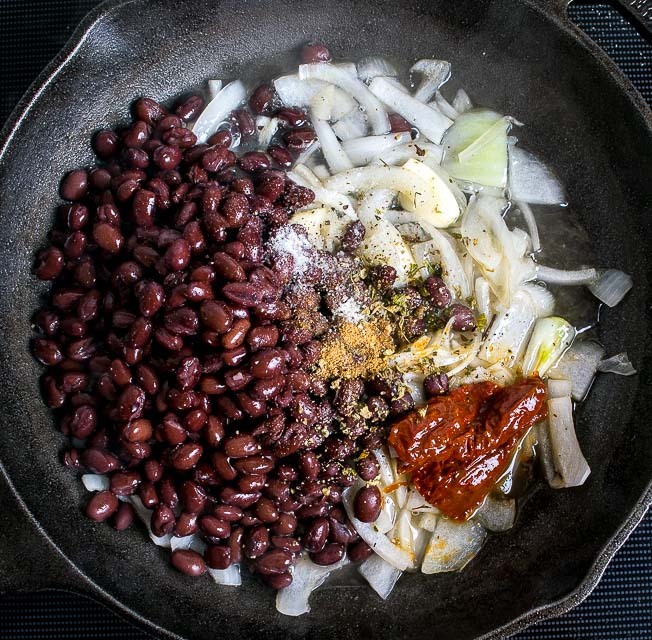 Once the onion is starting to brown, approximately 5-8 minutes, add 1 can black beans (drained and rinsed), 2 chipotles in adobo, 1 tablespoon adobo sauce, 1/2 teaspoon cumin, 1/2 teaspoon salt, freshly cracked black pepper, and 1/2 cup water (or stock). Let simmer for a few minutes until heated through and then add everything to a blender, combining well. Take a final taste for seasoning and heat. For the Tinga, start by cooking 1/2 onion and 4 whole, peeled garlic cloves in a dollop of oil over medium heat. Cook until the onion is just starting to brown, approx. 5-8 minutes. 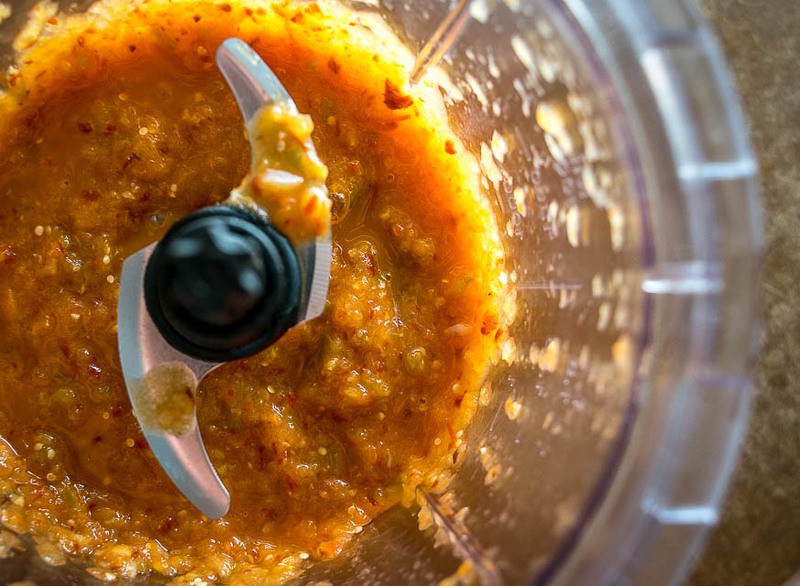 Add the onion and garlic to a blender along with the roasted tomatoes and tomatillos, and 5 chipotles in adobo. Combine well. Heat a dollop of oil over medium heat. Add the sauce from the blender along with 2 tablespoons adobo sauce, 1 teaspoon Mexican oregano, a dash of cumin (optional), 1/2 teaspoon salt, and some freshly cracked black pepper. Let simmer for a few minutes. Add the chicken to the Tinga sauce, combining well. Let simmer until everything is at a uniform temperature. Take a final taste for seasoning -- I added another generous pinch of salt to this batch. Add a layer of the bean puree and cheese to some corn tortillas. Cook in a skillet or comal over medium heat until crispy. 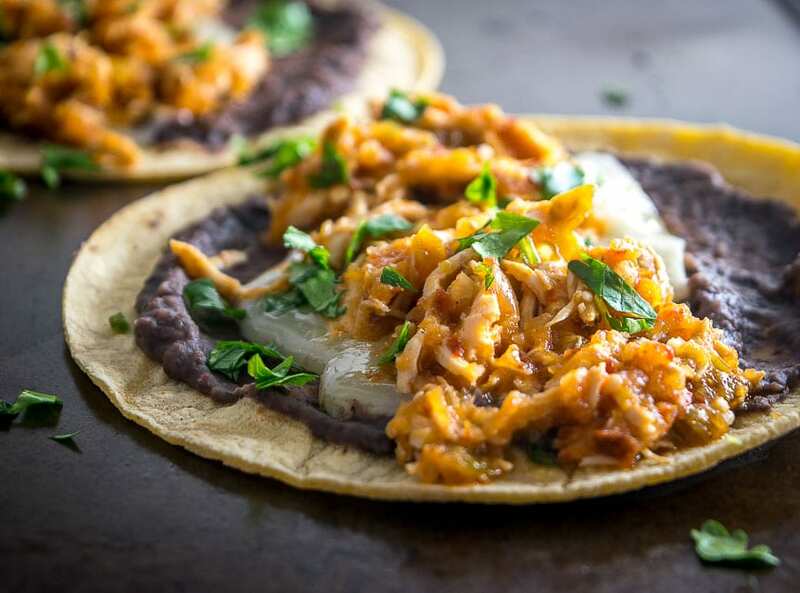 Top with Chicken Tinga and serve immediately. Final garnishes can include a squeeze of lime, hot sauce, or pickled onions. Alternatively, you can serve the Tinga on crispy corn tortillas (or tostadas) with avocado bits, raw onion, and Cotija cheese. Be sure to take a final taste for seasoning as exact salt amount will depend on which chicken you're using and whether it's seasoned or not. For this batch I added 1/2 teaspoon of salt directly to the sauce along with a generous final pinch, using chicken that was poached in salted water. I'm in the habit of cutting out the stems before roasting tomatoes and tomatillos, knowing that any juices leftover in the roasting pan will be added to the blender. I typically scrape out the seeds of the chipotles. 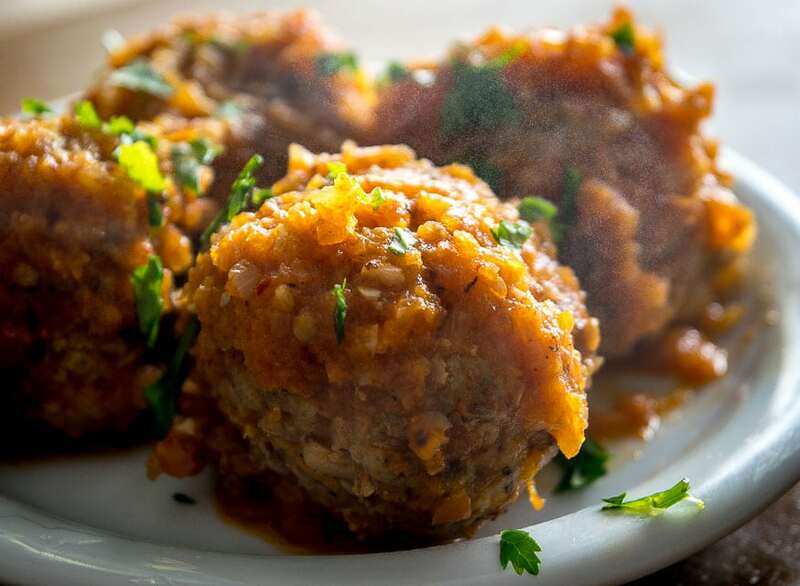 Our latest post is a traditional batch of Albondigas — Mexican Meatballs! Oh my gosh…yum! Making this for weekend! I made this and was surprised I needed to add more salt, as it was very flavorful. 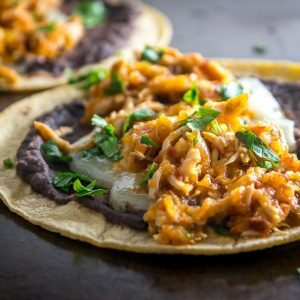 Other tinga recipes I’ve tried weren’t hot enough and this one is perfect; I poach my chicken in the Instant Pot while the veggies toast, this is a really hands off dish that yields a lot of food in a short amount of time. This is a great recipe and I can’t wait to try the black bean recipe! Awesome thanks much for your review, very helpful for other peeps. And thanks for mentioning the salt — I’ll make sure to note in the recipe box to take a final taste for seasoning as it is kinda dependent on what chicken is used and whether it’s seasoned yet or not. Yeah you nailed it — it yields a big batch and it’s so handy to have some in the fridge for quick meals. Cheers. This was awesome! My hubby doesn’t normally like chicken but no complaints in this recipe! I have to watch my salt so I didn’t add any – never missed it with all the other favors. Thanks for a keeper recipe I will make again. Awesome thanks much for your feedback Jen, so glad you found a keeper recipe! Yes great tip Ali thanks for mentioning this! I used to roast chicken breasts on the bone in the oven all the time but I stopped for some reason, not even sure why, but could be time to add it back into the routine. Thank you so much for sharing this recipe! I made it tonight along with Tamarind water for a true authentic dinner. My husband declared it was beat best authentic Mexican dish we’ve ever made. I admit to dialing back on the chipotles for my sake but still fresh and delicious. Thanks for the feedback Sue — so glad you guys liked the Tinga! Theeeeeee best puréed black beans ever, as was the spicy chicken Tinga. Even though I am a pretty good cook, it was satisfying to see my food come out just as pictured on the website, not to mention how delicious it is! Being on the East Coast I think I found the last of the fresh tomatillos available. Any suggestions how to make the Tinga without fresh tomatillos? Could I just use a tomatillo salsa in place of them? Thank you for all your great recipes and easy instructions! Thanks for the feedback Stephanie! I use that black bean mixture in all sorts of dishes and usually keep some on standby in the fridge. Hmmm for the Tinga if you can’t get fresh tomatillos then I think I would use canned tomatillos before using tomatillo salsa. 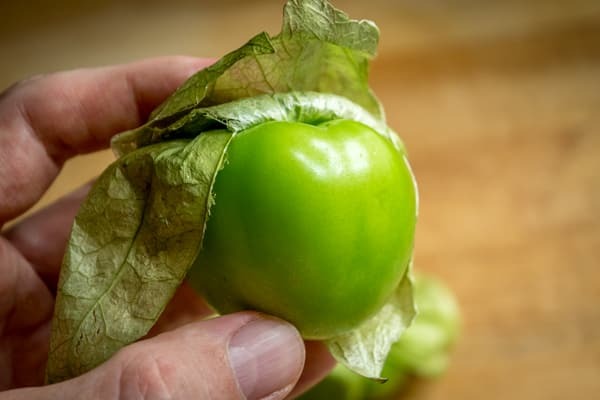 You’ll get a slight downgrade in flavor using canned tomatillos but I usually keep some on hand for emergencies and you could probably get away with using them in the Tinga sauce. Cheers.